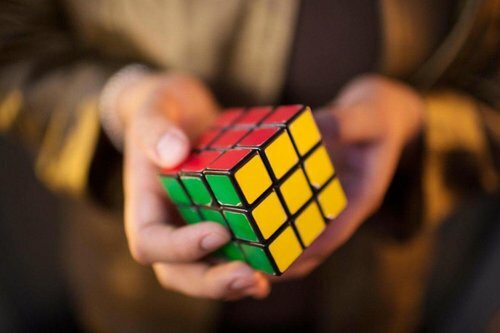 Players of Rubik’s cube are not just fascinated by the amount of focus and concentration it brings in their minds but the mental agility and problem-solving skills as well. Once they master the basis 3X3 cube, they start looking for more challenging options in the game and to meet their demands, there are way tougher cubes out there in the market. If you didn’t know, here are the other variations of the Rubik’s Cube you probably haven’t played. For some of us, playing the Rubik’s cube might be a little comforting because of the stark color variations in the labels. But imagine a variation that is completely grayscale and has only minimal tonal differentiation. Yes, the standard 3X3 cube comes in shades of gray that are barely differentiable. Apart from focusing on finishing the cube, you also need to focus on differentiating the colors. Personally, I feel Sudoku is one of the toughest number-based game out there and combining that with the concept of cubing is a challenge at a whole new level of difficulty. To understand how Sudokube works, imagine a plain sheet of Sudoku and fold it on all sides to make it a cube. Now, you need to solve the cube by filling all the columns and rows with the numbers 1 to 9 without repeating one in any of the rows and columns. Forget mental agility, the amount of expertise you would develop with this is phenomenal. Are you game? What appears like an adorable paperweight is one of the most compelling puzzles out there. This version of the Rubik’s cube has 12 sides with fifty movable pieces. The standard Rubik’s cube has just 20. So the effort that goes into solving this for a beginner or an intermediate is close to 2.5x. As the name suggests, this version of the cube looks like a pyramid in laymen terms. Technically, it is a tetrahedron, where the rules of the Rubik’s cube are retained. The Pyraminx is as challenging as the Megaminx with over 933,120 different variations in moves. The maximum twists required for you to solve the puzzle is 11 and it was only a couple of months ago that Tymon Kolasinski from Poland solved the Pyraminx within 1.20 seconds. That is the less than the time you spent in reading this sentence. One of the most fun Rubik’s cube out there, the Rubik’s Cube Earth comes with the map of the world instead of colors. To solve, you primarily need to know the map of the world on a broader sense to align the pieces together. A 3X3 variant, it is a great to learn geography and a good addition to your collection. Do you think the flat-earthers would be able to solve it? So, what do you think? So many variations of the Rubik’s Cube right? Like we always say, it’s a significant tool for mental development and the higher the difficulty, the more engaging and effective they would be. If you want to instill newer skills in your kids’ minds, we recommend getting them the kids or enrolling them to such programs for their holistic development.